© Berchtesgadener Land Tourismus GmbH Königssee lies between Berchtesgaden's Alps like a fjord. 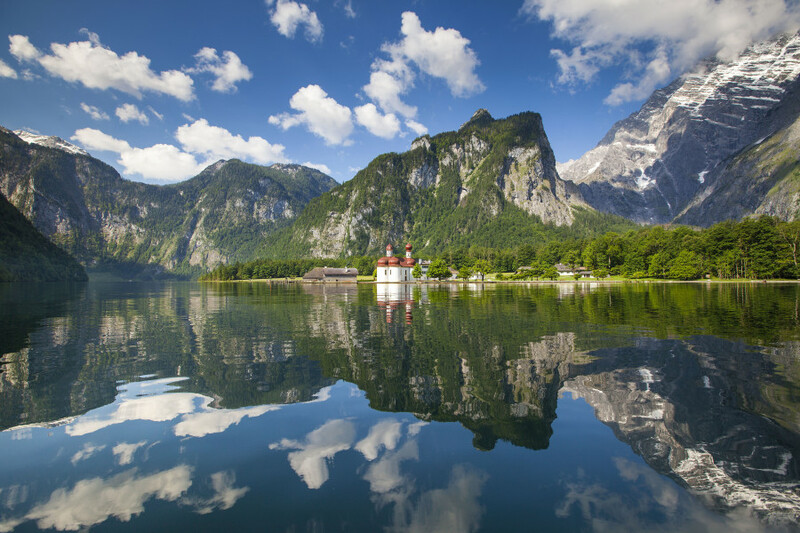 Lake Königssee in Berchtesgaden National Park is one of the most beautiful lakes inside the Alpine region. With its emerald colour and impressive rock faces, the mountain lake appears like a Norwegian fjord right in the Alps. The quality of its water is excellent; it is said to be one of the cleanest lakes in Germany. Due to the rocks, however, the shores are hardly accessible. Crossing the lake is only possible by boat (see Things to Do). Up to 190 metres deep and 7 kilometres long, even close to the shore Königssee doesn't reach 20 degrees water temperature in the summer. Swimming is allowed though, and practised especially by hardy locals. You can enter the lake directly underneath the bobsleigh run at Seelände in Schönau. A much nicer entry spot is „Malerwinkel“, a paradisaic bay on the lake's northeast side (caution: slippery stones). As lake Königssee lies amid the national park, rubber dinghies and inflatable mattresses are prohibited. A bathing beach, changing rooms, and lying areas are not available. © Berchtesgadener Land Tourismus GmbH Pilgrimage church St. Bartholomew is lake Königssee's famous Landmark. It is accessible only by boat. While bathing opportunities are limited at lake Königssee due to the cold temperatures, there are numerous other things to do. First of all, don't miss out on a boat tour on the large electric boat (available year round; dogs must wear muzzles). You will experience the famous echo wall at the lake's west side, where the sound of trumpets or flugelhorns reverberate impressively. Moreover, you pass by truly magnificent scenery that has been attracting painters and photographers for centuries. The only way to get to lake Königssee's Landmark, St. Bartholomew's Church, is by boat. It is located on a peninsula. Next to the church, you can stop for a bite to eat at a former hunting lodge. Right at Seelände in Schönau am Königssee you will also find a number of restaurants, kiosks, and hotels. 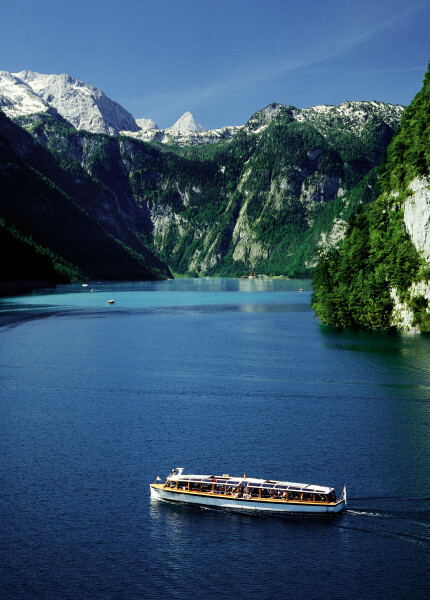 During the summer you can rent a rowing boat and discover lake Königssee on your own. For instance, you could moor at the little island Christlieger, where several trees as well as a 1.80 metre statue of Saint Nepomuk are located. Fishing enthusiasts are well-advised to check out Königsseer Ache at the lake's tail, where you can fly-fish (maps available at Schönau tourist information). 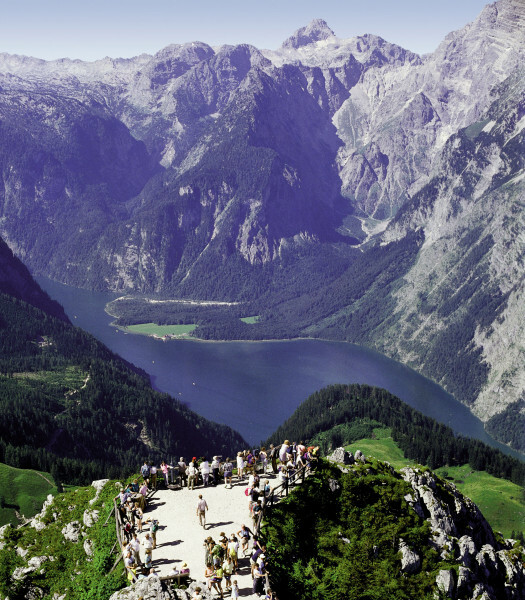 The region around lake Königssee is also perfect for hikers. There are easy trails going from Salet pier to idyllic Obersee; from Seelände in Schönau to the scenic outpost „Malerwinkel“; or along Königssee's east side. For those experienced in mountain hiking and phyiscally fit, climbing up to Kärlingerhouse on lake Funtensee, up the Watzmann (difficult multi-day tour!). Salzalpensteig – a long-distance hiking trail from lake Chiemsee to Lake Hallstatt – also passes Königssee. There is no bike path around the lake. However, Seelände in Schönau is easily accessible by bike. This is where Bodensee-Königssee bikeway ends. Lake Königssee is located in the south-eastern part of Germany, right at the border to Austria, near Salzburg. Schönau am Königssee can be reached by car from the North, West, and East via motorway A8 (München-Salzburg). Exit at Bad Reichenhall and follow the signs on B20 until Königssee. Coming from South via Tauern motorway, you exit at Salzburg Süd, and follow B305 to Berchtesgaden and B20 to lake Königssee. Sufficient parking is available at Seestraße 3 in Schönau (fee required). On public transport, you take an ICE train to Berchtesgaden, and then change on busses 841 and 842 (RVO) on to lake Königssee.